This is high quality polygonal model Armchair. Textures included. System unit setup used - millimeter. Rendered in V-Ray. Gamma 2.2 Object are organized by group. All objects have materials No missing textures and texture paths cleared All objects have 1:1 scale This model contains 18408 polygon and 10084 vertices with subdivision 'on' (1 iteration) FBX, OBJ files exported without meshsmooth modifier. In the scene there are 2 V-Ray plane light and 1 V-Ray camera for studio lighting. Click render and you have same image as preview. The Alfi armchair is a natural addition to the collection and captures Alfis character and comfort. For the armchair, the frame is extended and arms are integrated with the frame, allowing the back to flex and retaining the strength and simplicity of the Alfi Collection. Emeco and Morrison together, designed and engineered the Alfi Collection, with the conviction that what you dont see is as important as what you do see. Alfi reflects Emeco and Morrisons common appreciation for the invisible qualities behind simplicity. Made of reclaimed and responsibly selected materials, engineered for comfort and strength, and designed to be humble and timeless, Alfi embodies these hidden values. 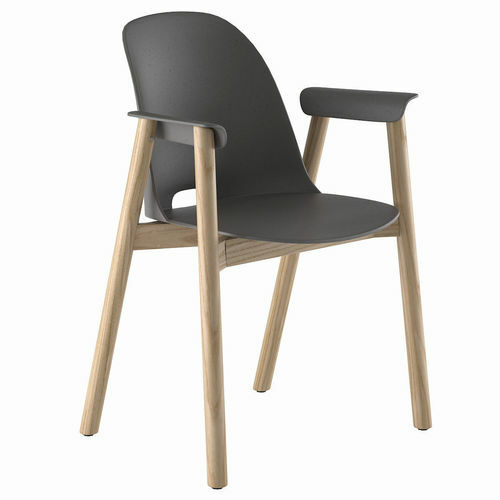 Alfi seats are made of 100% reclaimed post-industrial waste 92.5% polypropylene combined with 7.5% wood fiber. Bases are made of responsibly harvested, locally sourced wood and crafted by Amish craftsmen.